Is Your Deck Safe? It Could be Hazardous! Frank Lamphere, owner of The Deck Inspector a deck safety inspection service that serves Chicago and it's suburbs and A-Affordable Decks based in Lombard, Illinois says "Whenever you build or make structural repairs to a deck, it is important to make sure that the repairs are done by an expert. Also, obtain the required permits (if required) to help ensure your family and guests enjoy your deck without worry of failure or collapse". As a home owner there are some simple things you can do which may help prevent unexpected problems with your deck. Use the checklist below to help you inspect your deck for possible unsafe conditions. 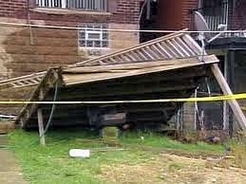 Better yet, have The Deck Inspector perform a professional deck inspection for your Chicago area deck or porch. 2. Check all fasteners, bolts, joist hangers and other hardware for rust and/or corrosion. 3. Check all guards and rails to be sure they are sturdy and secured. 4. Cracked and rotted stair stringers. Tread movement. This scene is becoming more common. 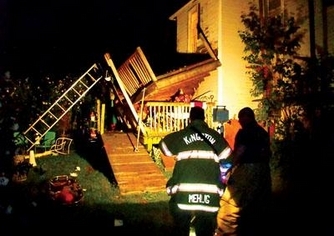 A deck collapse with potentially deadly results. of sudden collapse. That is unacceptable! I detect the problems and recommend the solutions to all of your deck's ills.